The summer timetable of the evening prayer programme begins on June 1 in Medjugorje. Rosary will be at 6 p.m., Holy Mass at 7 p.m. and after Holy Mass there will be regular prayer schedule, depending on the each day. Adoration of the Blessed Sacrament on Saturdays and Tuesdays will be at 10 p.m., and on Thursdays at 8 p.m. after the evening Holy Mass. 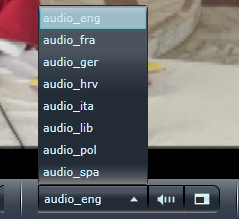 You need to select the english translation via bottom audio tool bar. More stable but Quality not as good as Smooth Stream. For the time being the English Translation will now be coming directly through the live stream. For this Important and God sent opportunity to continue, it will rely on the generousity of pilgrims, please help by donating. The cost of providing both the live stream video and the development of a simultaneous translation of the Evening service is a financial burden and we are aware that this is not the most convenient time to ask for money, but we need your ongoing donations to be able to continue this mission of bringing Medjugorje into your homes. It is so important as there are many pilgrims who cannot get to Medjugorje due to financial difficulties or health problems. Please help them experience the power of Medjugorje. If you would like to donate however big or small to help Medjugorje in spreading Our Ladys message to the world, then please donate using the 100% Paypal Secure donate button above or hand it into the Medjugorje Information Office. It cannot continue without Your help!! !